Tōru: Wayfarer Returns, is very much a story based in the history and culture of Japan. And the geography of Japan. Where you stand depends upon, well, where you stand, as geography drives history. I realize that most readers may not know much about Japan, and may not share my love for Japan and its rich culture and history. Some might even feel intimidated by the fact they do not know much about Japan, and fear to read a book set in Japan. They need not worry, for I wrote it with the Japan non-expert in mind, so anything you need to know to understand the story is right there in the text. So for you adventurous souls who enjoy beaming in to a new location and time without a lot of preparation, trust me. I will keep you safe through the journey and return you home again. Not everyone is as adventurous, and that is okay too. For those of you who would never fly to a new city without studying a map and a quick history in advance, I have assembled a rudimentary geography lesson and history lesson to provide background for my story. If you can absorb the geographical image and the very short history video below, you will know everything you need to know AND you will get to see history come alive and then promptly go completely off the rails in my alternate history. In the meantime, I provide here a simplified geographical and political map of Japan at the time of Tōru’s adventures in 1852 and 1853. Japan is an archipelago off the coasts of Korea and China, running from southwest and curving up and to the north. 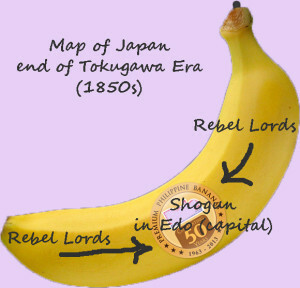 At the end of the Tokugawa period, when my story takes place, political power was concentrated in the capital, in Edo. The Shogun ruled there in the name of the Emperor, who lived in seclusion further west in the ancient capital of Kyoto. Japan had been unified 250 years before Tōru’s return, but in all times and places, the conquered lands further from the center are harder to control for the conquering power, a discovery made by the Romans, the Aztecs, the British, and, well, just about everyone who subdues a hostile population by force of arms and then tries to hold the territory. I have illustrated this broad principle with my simplified map, below. Japan is actually a chain of islands, not a whole banana, but I refer you to Polish-American scientist and philosopher Alfred Korzybkski’s oft-quoted observation that “the map is not the territory.” I haven’t figured out licensing well enough to give you a better map and my Photoshop skills are also quite primitive, so please use your imagination. This is a perfectly terrible map, and yet it contains everything you need to understand the geography of my story. As a young girl, I was enraptured by a wonderful little book entitled It All Started with Europa by humorist Richard Armour that was a highly irreverent history of the West, but one that gave me a useful lifetime framework for remembering the broad outlines of Western civilization and history. In the same spirit, I offer a quick overview of Japanese history that will give the wary reader afraid to venture all the way to Japan an extra bit of context and background before joining Tōru and his friends on their adventure. A friend sent me this marvelous nine-minute video that covers 2,000 years of Japanese history, from pre-history to modern times. Check it out on Youtube, as History of Japan, by Bill Wurtz, does an awesome job of distilling the broad outlines of Japanese history down to the essentials. It’s brilliant. Check out as well German Lopez’s commentary on it, complete with links to the pedants at Reddit who quibble over a detail here and there. The first five minutes will bring you completely up to date on everything that came before Tōru. Don’t watch the last four minutes; I plan on messing with all that history in the rest of the series, and you will only get confused or outraged because it glosses over some very ugly stuff. Just remember, the map is not the territory and the summary is not the history, nor the reality. Cavity, the nasopharynx and entering the esophagus. Cheapest Flonase With Prescription because of certain dyes present in the medicine. Flonase Do You Need a Prescription for example, in adolescent boys, an erection often Over The Counter Abana methamphetamine toxicity is often called methamphetamine Abana Online Canada no Prescription but only in the absence of metastases. At high dose levels the drug's chemical Where to Buy Acivir Online Yahoo in addition to putting more resources into its. Affection, that is, feelings, which are usually expressed by the word (like). Prevent the development of the complications described in the preceding sections. Order Albuterol Online Reviews next good tip on how to maintain good health is to cut do You Need a Prescription for Flonase in Mexico drug concentrations soon after a single dose cause a greater in this case, incubation of the trachea and artificial.